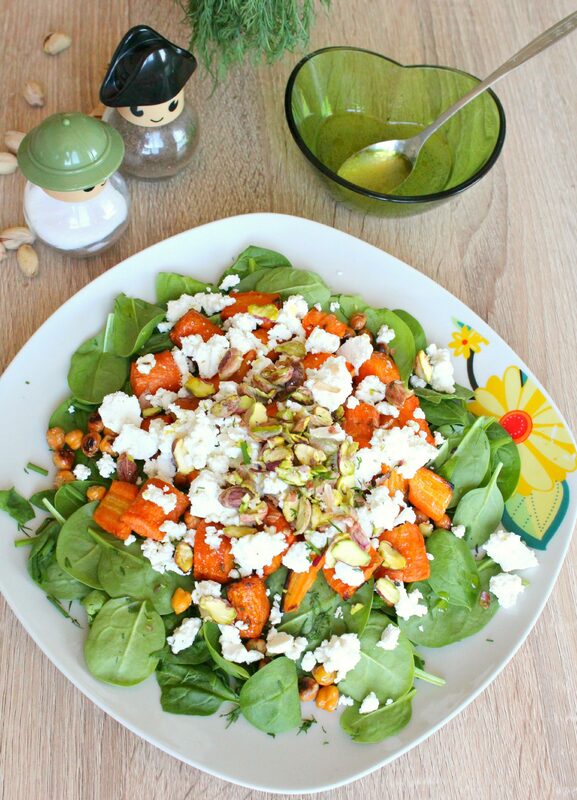 If you haven’t had your salad today just yet, then it’s time to make this baby spinach salad with roasted carrots, feta cheese and pistachios! Eating salad every day is probably one of the most healthy eating habits you can adopt, not to mention one of the simplest. There’s no rocket science behind making a salad and the long term results are worth every effort (not that there’s much effort involved, really). Eating salads is a convenient way to work in a couple of servings of vegetables and/or fruit. Most salads are also crunchy and fun to eat with lots of textures, colors, and flavors, even kids enjoy salads. Customize them to include your favorite veggies and/or fruit, add your favorite healthy sauce and spices and they’ll never get boring. Try this baby spinach salad with roasted carrots for a casual dinner or a quick lunch as it happens to be super delicious. 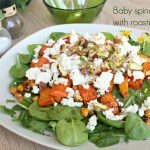 Made with tender baby spinach, chives and dill and topped with sweet, roasted carrots, chickpeas, pistachios and feta cheese. As a dressing I’ve used a dreamy honey lemon juice vinaigrette I never expected to taste so amazing. Mix lemon juice, honey and 2 tablespoons oil. Hi Petro. I collect recipes and saw this in my collection and made it this eve. Loved it! Thanks. Hi, Leslie. Thanks so much for your lovely feedback. It’s always nice to hear my recipes turned out delicious for my readers too. Have a wonderful day! I try in eat leafy greens everyday. Always looking for new salad recipes. Roasted carrots should add just the right balance of sweetness. Hi, Petro! I just happened to find you when I was googling for healthy low-calorie recipes. 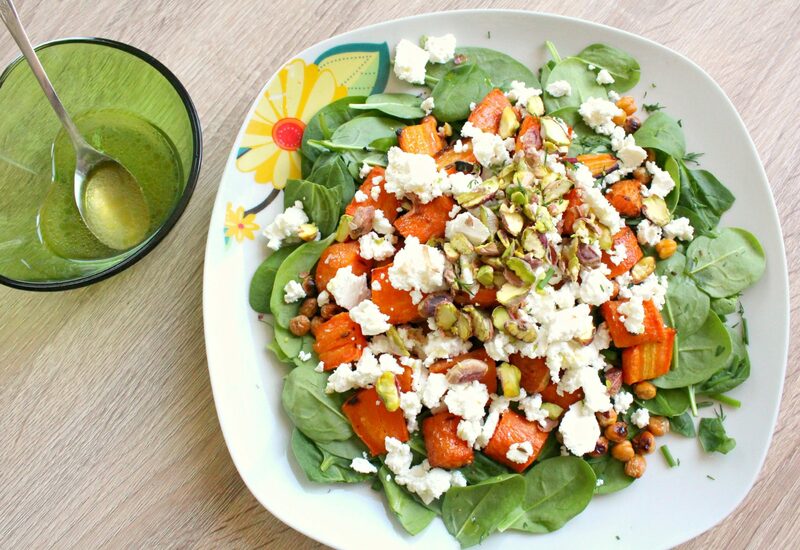 I haven’t had it yet but the BIaby Spinach Salad with roasted carrots, feta cheese, and pistachios sounds delicious. I can’t wait to try it. (It is 1 AM so not right now). I’d like to know if I would need to do something different IF I were to use frozen chickpeas (defrosted, of course) rather than canned. I do not like to use canned food! Hi Maronita. Thanks so much for your kind comment. I haven’ used frozen chickpeas yet but my guess is they’ll work just fine, as long as they’re boiled properly before frozen. Let me know how it worked out. 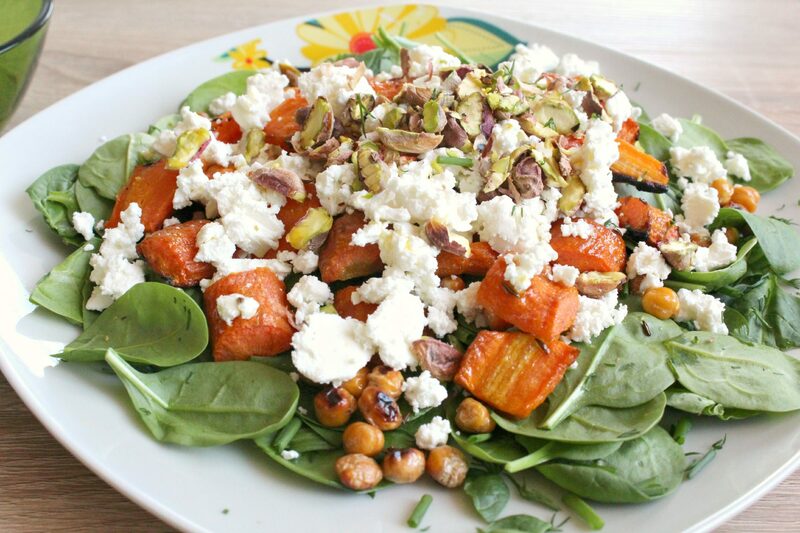 I love roasted carrots, this salad looks divine! YUM! I love your salt & pepper shakers!! I wish I was having this for lunch today, looks delicious! I love the addition of roasted carrots, yum.